If you're in or near Ipswich, the kids don't have to drive you wild jumping all over the furniture when Just Jump Trampoline Park and Play Centre gives them hours of fun - open seven days a week. Located at Ipswich suburb, Redbank, an easy half-hour drive from the Brisbane Central Business District, Just Jump offers one hour sessions for a small cost. The good news for mums and dads is that there's a cafe on-site so you can sit back, relax and watch the youngsters burn off the energy. All you have to do for a bouncing good time is bring your socks and you're off! For the admission price, you have an hour of Trampolining and unlimited Indoor Play, which includes Jumping Castles, Imagination Play, Slacklining and Ballsports. If a child is two or under, an adult can join in the jumping fun and pay just for the child. 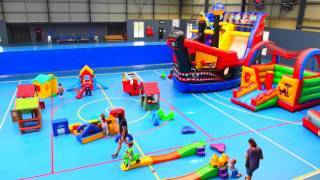 Just Jump Trampoline Park and Play Centre is a popular spot for fully catered birthday parties, and they also offer hot food platters. There's a discount for group bookings, group fitness classes and upstairs is a gym, Just Sports n Fitness.